There's a new crane on Dean Street set up to place modules for the 32-story B2 apartment building. 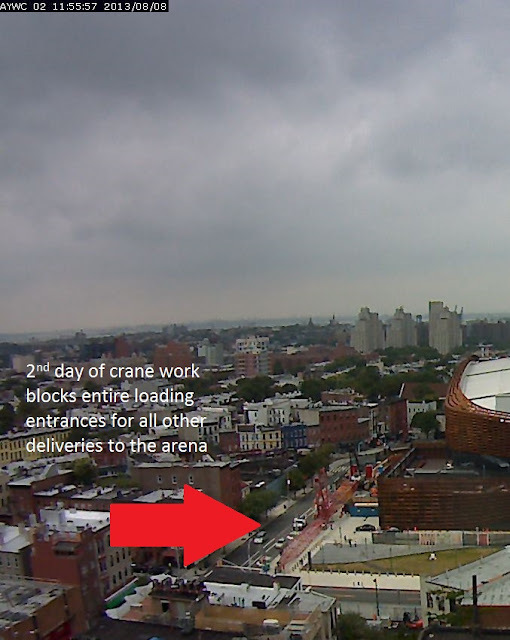 But on Wednesday and a good part of yesterday, I'm told, work assembling and adjusting the crane shut down access not only to Dean Street (which was predicted for one day) but also the arena's loading dock. There are typically deliveries daily, more of course when events are scheduled. Surely some of the prep work for the MTV Video Music Awards requires deliveries. Surely those deliveries will get done, but it's clear that the crane work--and the challenge of operating an arena while construction occurs on an adjacent site--makes for complications. Does Prospect Heights really have 'richest' look?